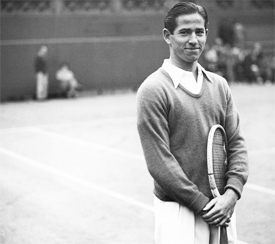 What was Bobby Riggs' real bet on himself at Wimbledon in 1939? Before the start of Wimbledon in 1939—his first and only appearance there--Bobby Riggs walked into one of London's legal bookmaking parlors. An American magazine writer several years later wrote, "This particular bookmaker was confronted a day before.the tournament began by a customer with an outrageous notion in his head." As excerpted here from the June 1950 issue of Sport magazine, the exchange went like this: "In America," he said, "we like to make parlay bets. You know, if you win on the first one, all the money goes on the second one, and if you win on the second one, the whole pile rides on the third one-and so on. You know what I mean? Ever hear of it?" The Englishman nodded his head gravely. "Well, I want to get down a parlay on this tennis tournament. We've got some pretty good American players in it, you know." "So I have heard," agreed the proprietor. "Of course, Wimbledon is a world championship tournament."